You can never be too safe if you encounter a dingo in the wild. As the biggest hunter and apex predator in Australia, they are considered to be dangerous. Fraser Island has a large population of around 200 individuals, and are often spotted by visitors to the island. The best defence against dingoes to be dingo safe. This means being smart and aware of your surroundings while on the island. This includes travelling in groups (the larger the better as it makes them less likely to attack), never feeding dingoes, proper disposal and storage of food or rubbish, staying with arms reach of children in case a dingo wanders too close and camping inside of fenced areas. If you do encounter a dingo but are in a safe space such as a vehicle, tour bus, or fenced off area, feel free to take photos and admire them from your safe zone. Never throw food to them or tempt them to come near you in any way. Be as dingo safe as you can so that you are less likely to come across one of these animals unawares. 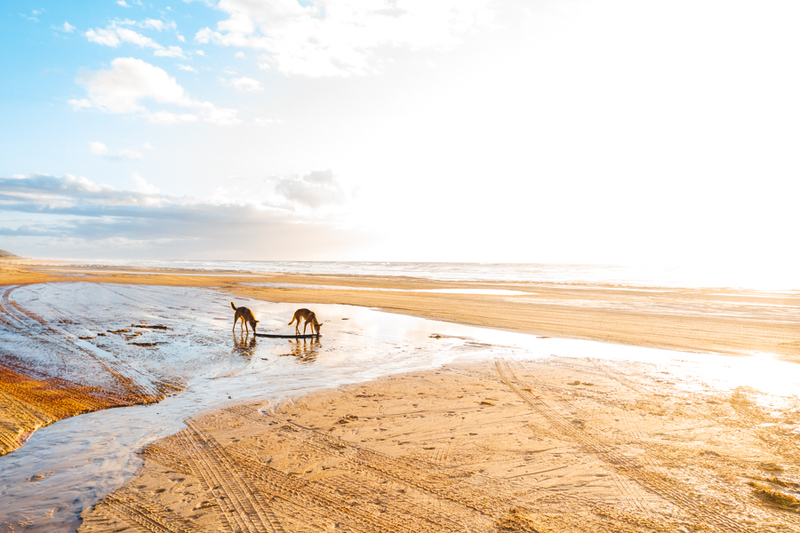 They are amazing animals to encounter if done in a correct way, and Fraser Island is one of the best places to do just that!